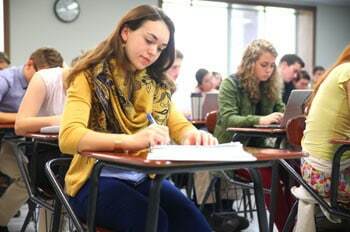 Students interested in attending Christendom College now have an additional standardized testing option – the Classic Learning Test (CLT) – to go along with the standard SAT and ACT tests. The CLT, which utilizes a multiple choice system based on readings from some of the greatest minds of Western Civilization, gives students with a classical education a testing system better suited to their educational strengths. Christendom is one of the first colleges to add this new aptitude test as part of its admissions process. “We have prospective students from diverse educational backgrounds who apply to Christendom each year. Not everyone receives the same training for standardized testing while in high school. The CLT will give students a new way of producing test scores that relies on the works of C.S. Lewis, Socrates, and others, allowing them to reveal their knowledge in a manner that’s more in tune with the rigorous, liberal arts education provided at Christendom College,” says director of admissions Sam Phillips. Classical Learning Initiatives (CLI) created the CLT in the fall of 2015 after co-founders Jeremy Tate and David Wagner considered the many problems inherent in contemporary American education, and desired to create solutions to them. “Surrounded by the natural beauty of the Shenandoah Valley, Christendom College stands out in the contemporary landscape of higher education as a college uniquely focused on the education of the whole human person. Classic Learning Initiatives encourages anyone pursing a classical education to take a close look at Christendom College,” said a spokesperson from CLI. According to CLI, the CLT invites students to wrestle with works of the greatest minds in the history of Western thought across literary and mathematical content, with rich material reflecting both theistic and secular perspectives benefiting and enriching the student in the test taking process. Students can take this two-hour exam at a local testing center and receive test scores in less than a week. Registration for the CLT opens on April 1. For more information on how to apply for Christendom via this new testing system, please contact the college’s admissions office. To discover more about the CLT, please visit here.